Soratnik can be equipped with a wide range of weapons from 7.62 mm cannons to 12.7 mm machine guns. Is the world ready to trust a robot to operate independently in combat? If you’ve ever watched ‘RoboCop’ you’ll know what happened when the ED-209 droid short circuited - let’s hope this scenario remains fiction. 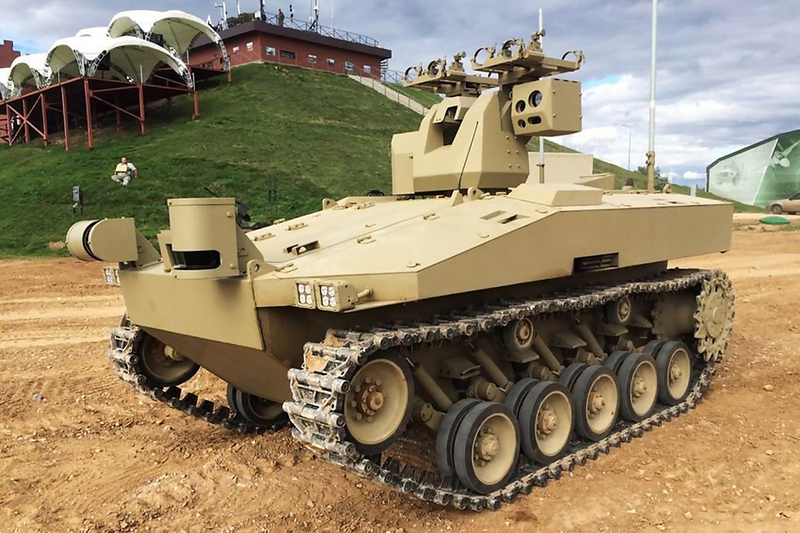 Kalashnikov Concern - the largest arms manufacturer in Russia - has created a seven ton robot called ‘Soratnik’ that’s designed to help the country’s military battle terrorists at home and abroad. It has caterpillar tracks to traverse rugged terrain and thick armor to withstand artillery and grenade attacks. Looking like a small, unmanned tank, Soratnik can be equipped with a wide range of weapons from 7.62 mm rifles to 12.7 mm machine guns. Engineers also plan to deck the machine out with 30 mm jet fighter guns and anti-aircraft missiles. This robot can cooperate with UAVs (unmanned aerial vehicles) flying over battlefields and operators controlling the robot from the safety of a bunker or secured area. Its software uses AI and Soratnik works in three different modes. The first is with an operator, who is able to control the metal beast from up to 10 km away. The second is semi-automatic mode, but information about this is being kept top secret. Izvestia military analyst Alexei Ramm told RBTH the robot will find and hunt down targets independently, and recognize the difference between friend and foe. The robot will also provide information about targets. Based on this data, the controller will tell the robot to attack or not. The third regime: Fully automatic. It will do the business independently - Terminator style. “This is the most interesting and intriguing thing as military officials and experts around the world aren’t ready to let a machine make decisions independently. Despite the fact that giving robots total freedom on a battlefield requires enormous legislative work, it’s still not clear how it will distinguish combatant targets from civilians,” Ramm added. He believes it will take years before such AI will be seen in combat.